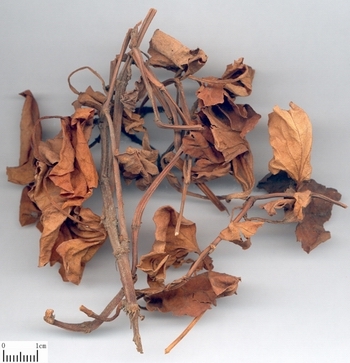 The aerial parts of Houttuynia cordata Thunb. of Family Saururaceae. Mainly in south of Yangtze River. Collected in summer when the stem and leaf is flourishing with much spicas. Fishy smell and slightly astringent taste. Complete stem and leaf with spica, grayish green in color, and strong fishy smells. Pungent, cold; lung, liver, bladder and large intestine meridians entered. Clear heat and remove toxicity, cure abscess and discharge pus, clear lung heat, clear heat and remove dampness. 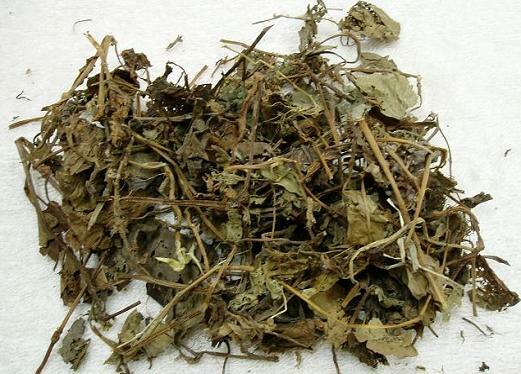 It excels in clearing lung heat to dispel phlegm and stop cough, clearing heat and removing toxicity to cure abscess and discharge pus, so it is the essential herb for treating pulmonary abscess due to heat-toxicity accumulation in lung. 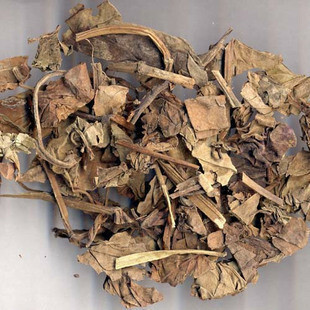 For pulmonary abscess in initial stage manifested as fever with chills, cough and chest pain, it is effective when its pounded juice being taken singly, as in Ben Cao Jing Shu (Classic Theory of Materia Medica); the effect gets much better when it is combined with heat-clearing, toxicity-removing, and wind-heat-dispersing herbs, such as Jin Yin Hua, Lian Qiao, and Huang Qin, etc. For pulmonary abscess in stage of ulcerous pus, cough and vomiting with purulent phlegm, it should be combined with herbs for clearing lung heat and discharging pus such as Lu Gen, Yi Yi Ren and Jie Geng, etc. It is also used commonly to treat dermal sores and abscess with swollen pain. For red swelling with burning pain in initial stage or pus forming due to excessive heat, it can be used singly in oral taking, or its fresh product is applied topically after being pounded, or combined with toxicity-removing, and abscess-curing herbs, such as Zi Hua Di Ding, Lian Qiao, and Pu Gong Ying, etc. For cough due to lung heat, it works when being used alone or combined with other herbs for clearing lung heat, dispelling phlegm and stopping cough to enhance the effects. It also has the action of clearing damp-heat, inducing diuresis and relieving stranguria, and is indicated for various syndromes of damp-heat, such as stranguria syndrome, Leucorrhoea disease, diarrhea and dysentery, and jaundice, etc. It is often combined respectively with diuresis-inducing and astranguria-relieving herbs, heat-clearing and damp-drying herbs, or dampness-excreting and anti-icteric herbs. Decoct 15~30g, or 60~100g of the fresh product. Proper dosage is for topical administration. Long time decocting is not proper because it contains essential oil.